Can't help but remember trying to get the Beatles White Album in stereo (I still have it too), Mono was in stock and the sales person suggested stereo was a passing fad anyway. I chose make a special order and to wait the two week it took. There were so many sonic-mixes and instrumentation differences in the White Album MONO vs Stereo release... that White Album collectors insist one should have both versions to get a more complete 'picture' of the variations in content and timing. It was a lot more involved than just some engineer who twisted the PAN pots on the console and exclaimed, "Yureeka! Now we have a Stereo Mix!" A shortlist of movies already register as having Atmos on iTunes but allegedly they don’t all offer it yet when played on the Apple TV. Allegedly, Blade Runner 2049 has working Atmos. I’m too cheap to pay for it to find out. I would pay for Ready Player One though but it’s preorder only. Did your receiver indicate it was receiving a Dolby Atmos bitstream, or were you hearing music from the ceiling speakers because the Dolby Surround function of Dolby Atmos was automatically upmixing the stereo bitstream to an Atmos experience? "Dolby Surround" used to mean Dolby's original matrix-surround product for home use. They've started repurposing that brand to mean the function built into Atmos-capable receivers that upmixes 2.0, 5.1, and 7.1 sound inputs to Atmos output (5.1.2, 7.1.4, whatever you've got). I can confirm that swiping between screensavers also works on the iOS 12 beta app as well as the Siri remote. And all done on a 4 Track if memory serves? I think this update is lackluster and it's sad things like name change are touted as "new features". Shows how lackluster this is. And "check cable" has been there so cross that out as a new feature. Not sure the relevance of your comment but I can assume it's about Atmos? The problem with Atmos is that it requires so many speakers and is expensive. Finding a 7.1 system alone in a home is tough and most people don't even know how to set up a simple 5.1 system. Add receivers in the mix(which aren't user friendly) and you have a mess. I set up a 2.0 system for my sister and she won't even turn it on. That's how "user-friendly" this stuff is. I wish Apple would develop a soundbar since Apple makes things just work. Are any "Atmos" soundbars even worth a grand? AppleTV can be so much more. It has so much potential but they seem not interested in them, as they just prefer to concentrate on streaming uses. 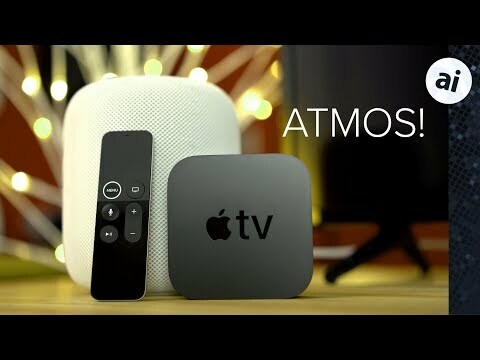 FYI: Really serious fans of high-resolution movie sound should note that the version of Dolby Atmos supported by the Apple TV 4K is ‘DD+’ - a relatively compressed version designed to suit streaming compared with the full-bore Dolby TrueHD delivery system used on 4K Blu-rays. So the Dolby Atmos sound from the Apple TV 4K won’t sound as pristine and dynamic as a good 4K Blu-ray Dolby Atmos soundtrack can. But even a DD+ Dolby Atmos mix can still sound clearly superior to a regulation, non-object-based soundtrack.